The quince is the only species in the genus Cydonia, which falls into the Pomoideae subfamily of the Rosaceae along with apple and pear. This plant is rarely cultivated outside of mediterranean climates, and is sometimes confused for the common flowering quince (Chanomeles speciosa), Japanese flowering quince (Chanomeles japonica) or Chinese quince (Pseudocydonia sinensis) which are fairly common edible landscape plants. All produce fruits that can be used as true quince fruits are used – in jams and cooking. 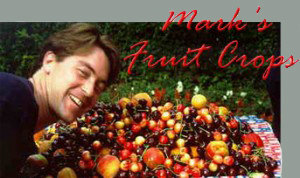 The main cultivars are ‘Angers’, ‘Champion’, ‘Orange’, ‘Pineapple’, and ‘Smyrna’. 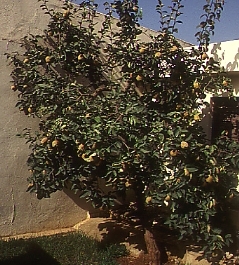 The quince has a long history of cultivation in the Middle East, where it is native, and throughout the Mediterranean region. 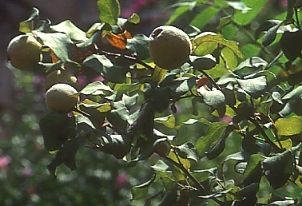 Greeks and Romans grew the quince for its fragrant fruit and attractive pink flowers. Very little production occurs in the US (< 200 acres), but 20,000 tons annually are produced in Argentina. In greek mythology, “golden apples” were probably quinces, since the Golden delicious and other similar colored apple cultivars were not available then. Thus, the tale of Hercules and the golden apples is probably a misnomer (greeks often referred to tree fruits generically as “apples”). The Greeks started the custom of giving a quince to a bride on her wedding day as a symbol of fertility; this ritual persisted well into the Christian era. Quinces are more important as rootstocks than as fruiting plants. 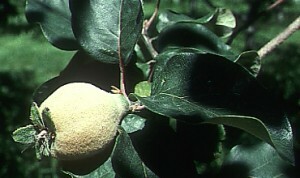 Quince is the primary dwarfing rootstock used for pear, mostly in Europe. It lacks sufficient cold hardiness and blight tolerance to be used in the Pacific Northwest region. Since quince is incompatible with many pear scions, a compatible interstock must be placed between the scion and a quince rootstock. ‘Old Home’ and ‘Old Home’ x ‘Farmingdale’ crosses (abbreviated OH x F) are commonly used for this purpose. Quinces are known for their strong perfume, and will freshen up an entire room if left at room temperature for several days. The scent is “musky-wild as a tropical fruit, reminiscent of pineapple, guava, Bartlett pear, and apple…” (Elizabeth Schneider). World = 334,761 MT are produced on about 43,000 ha (103,000 acres), mainly in Turkey (25%), China (9%), Iran (9%), Argentina (7%), and Morocco (7%). Very little production occurs in the US (<200 acres). A. Plant: Large shrub or small tree, to 4 m. Leaves elliptical, with entire margins, often larger than those of apple or pear. Light pubescence on underside. B. Flowers: Quince flowers are borne solitary, terminally on current season’s growth. Like apple, the ovary position is epigynous, or inferior, with the 5-loculed ovary embedded in receptacle tissue, containing several ovules per locule. C. Pollination: Apparently self-fruitful. Pollinator = honey bees. D. Fruit: a pome; the edible portion = hypanthium or receptacle tissue. Generally bright yellow and shaped more-or-less like apples, although some are pyriform. Seedlings or rootstock cultivars (e.g., ‘Angers’) have irregularly shaped, greenish, pubescent fruit. The flesh is dry and mealy, usually being cooked or made into jam, jelly, etc. Some cultivars are said to have pineapple flavor which can be eaten fresh if fully ripened (like ‘Aromatnaya’). Fruit ripen in autumn, with apples. Chilling requirement – relatively low, 100-500 hours. Cold hardiness – Wood and dormant buds tolerate -15°F. Because flowering occurs in late spring, spring frost is not a real problem. Quinces are extremely prone to fire blight and cannot tolerate wet, humid conditions well. B. Propagation: T- or chip-budded onto a variety of rootstocks.